Reviewed by Deborah Kennedy on 2015-11-09. The publication of this excellent edition of Helen Maria Williams's poem Peru comes at a time when her work is receiving considerable scholarly attention. It will join a number of her other books on the library shelves, such as the fine recent edition of her novel Julia (Pickering & Chatto 2010) and of her Tour in Switzerland (Slatkine, 2011). Like her Letters Written in France, edited by Neil Fraistat and Susan Lanser, (Broadview 2001) this book, edited by Paula Feldman and a team of Associate Editors, has an eminently teachable format. Published in paperback, it comes with valuable contextualizing materials such as a chronology, illustrations, and background readings. The only thing missing is a map; otherwise, everything has been thought of to make this an accessible and affordable book. While best known for her eyewitness accounts of the French Revolution, Helen Maria Williams (1759-1827) began her literary career as a poet. There has been some discrepancy about the year of her birth, which the editors give as 1761, but new evidence confirms that she was born in London in 1759 (Oxford DNB 2010) to Charles Williams, an army officer from Aberconway, Wales, and Helen (née Hay) Williams from Kilmany, Fife. After spending part of her childhood in Berwick-upon-Tweed, Williams moved back to London with her widowed mother and sisters, where she began publishing her poetry with some success. Encouraged by the Reverend Dr. Andrew Kippis, her literary mentor, she soon became a popular poet of sensibility, writing in a pensive key about life, art, religion, and history. After reading her poetry as a teenager in the Lake District, Wordsworth made her the subject of his first published poem: "Sonnet on Seeing Miss Helen Maria Williams Weep at a Tale of Distress" (1787). This poem, included in an appendix to the Broadview edition (218), marked out the two poets' lifelong interest in society's treatment of the poor and disadvantaged. Williams published several poems about the tragic effects of war, including her first long piece, Edwin and Eltruda (1782), about a family divided by the War of the Roses. This was followed in 1783 by An Ode on the Peace, about the American War of Independence. Williams thus seemed born with a natural curiosity about the affairs of the world and an inherent sympathy for others. It is this context that enables us to understand why she wrote a poem about Peru. This edition provides a helpful structure for reading Williams's poem, with valuable footnotes showing where her poetic dramatization diverges from the historical record about the "fall of the Peruvian empire" (49). Her two main sources were both published in the late eighteenth century: Abbé Raynal's Philosophical and Political History (1770) and William Robertson's The History of America (1777). Williams developed a longstanding interest in this region of the world, as she later translated Alexander von Humboldt's books on his and Aimé Bonpland's important voyage to South America. Other works on Peru demonstrate the keen contemporary interest in its history, including Madame de Graffigny's Letters Written by a Peruvian Lady (1747); Jean-Francois Marmontel's The Incas; or, The Destruction of the Empire of Peru (1777); August von Kotzebue's play Pizarro (1796), later translated by Williams's friend Anne Plumptre; and Richard Brinsley Sheridan's own popular adaptation Pizarro (1799). The appendices to the Broadview edition include excerpts from several of these historical and fictional works. As Paula Feldman explains, there are three versions of Peru, beginning with the one originally published: Peru, A Poem. In Six Cantos (1784). Much longer than Williams's earlier poems, it was also significant as the first of her books to have her name on the title page. In 1786 she included a new version of Peru in a two-volume collection of her poems, and forty years later she altered the poem once more for her Poems on Various Subjects (1823). The Broadview edition includes two versions of the poem laid out in an easily readable good-sized font: the revised Peru (1786) and the retitled Peruvian Tales (1823). But the 1786 Peru (47-97) is really the primary text, with the shorter Peruvian Tales (101-35) providing a further option for students and scholars who wish to do comparative studies. What is notable about Williams's Peru is how she turns the well-known story of the sixteenth-century Spanish conquest of the Incas into an emotionally compelling poetical work. Looking back on her career, one can see that the subject was tailor-made for Williams, who looked upon the world with a sensitivity that made her a true woman of feeling. It was her genuine concern for how others were treated that led her to take up the history of Peru, and soon after to examine the slave trade and to share in the early hopes for the French Revolution. Williams's story of Peru, therefore, offers a moral lesson about the relationship between nations. Though neither she nor any of the vast majority of her readers had ever visited this distant country, she strives to make them care about what happened long ago there. In rendering the landscape of Peru, its people, and their losses at the hands of the Spanish forces led by Pizarro, her poem exudes a mythic quality that elevates it above a dry historical account. One reviewer praised the "passages of fire and of pathos" in her work (qtd. 232). She writes in an ennobling form of discourse, where, against the backdrop of misty mountain tops, an allegorical figure like Sensibility will "slowly wave in air her snowy wand" (6:232). Each of the six cantos of Peru is preceded by a short Argument or gloss. For the most part, Williams follows the historical sources, though she leaves out some events, embellishes others, and invents several characters--all of which changes are carefully noted by Feldman and her editorial team. The poem begins by richly evoking the Peruvian landscape: its flora and fauna, its llamas and pineapples, its bird calls and overhanging tree blossoms. But Canto One also announces the fate of "lost Peruvia" (1:80; 1:179), and from Canto Two onwards, Williams highlights the suffering and heroism of individual characters to unfold the history of King Ataliba and his people. Her Argument for Canto Two is succinct: "Pizarro, a Spanish Captain, lands with his forces--his meeting with Ataliba--its unhappy consequences" (58). Simple adjectives contrast "stern Pizarro" (2:2) with "mild Zorai" (2:35) and "stern Valverda" (3:28) with "soft Zilia" (3:35), and while often using a masculine diction to represent the military might of the Spaniards, Williams renders the Peruvian landscape in feminine terms. In this clearly demarcated battle between good and evil, there are yet heroes on the Spanish side, such as the Roman Catholic priest Las Casas, who is shown trying to help the victims of a massacre. Williams provides a footnote for "that amiable Ecclesiastic" (66), though this was an example of poetic license on her (and Marmontel's) part, since, as the Broadview editors point out, Bishop Las Casas served in Mexico but not in Peru (66; 204). Williams's examples of heroism or courage provide relief from the wrenching tales of slaughter and the frequent descriptions of "purple" torrents (5:68) and "the crimson ground" (5:82). In Canto Five, for instance, the Spaniard Alphonso takes pity on the beautiful Peruvian woman Aciloe, her betrothed Zamor, and her elderly father, letting them go into exile in Chile. But singular acts of kindness do not change the overall ending. Even the romantic story of Cora, the wife of a Peruvian leader, ends tragically (4:65-8; 6:65-112). In Canto Six, Williams returns to "the field of blood; / Where bath'd in gore, Peruvia's vanquish'd train / Lay cold and senseless on the sanguine plain" (6:28-30). As Feldman points out, "while her idealized treatment of the Peruvians contains moments of contradiction, Williams offers their example as a powerful critique of oppression, in the Americas, in Europe, and elsewhere around the globe" (35). A poem of this scope, which aimed to improve the world through the lessons of its history, set Williams apart from her contemporaries. She had the confidence to try writing an epic poem, a genre unlike the shorter verse, sonnets, and occasional poems that other women poets were writing in the 1780s. As Feldman notes, this edition will help to showcase her contribution to the development of the epic form (35). It also reminds us that Peru immeasurably increased Williams's fame. Besides partly inspiring (perhaps) Wordsworth's sonnet in her honor, it led several other poets to celebrate Peru directly. The appendix to this edition includes four examples of such commendatory verse, along with two illustrations of the poem designed by J. H. Ramberg and engraved by the famous Francesco Bartolozzi. 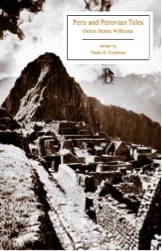 (The cover photo of Peru's Machu Picchu is anachronistic, since this now-iconic fifteenth-century site--rediscovered in 1911-- was unknown in Williams's time.) Clearly, then, the success of Peru enhanced Williams's literary reputation and marked her out for greater things to come. Peru is an ambitious poem, and within its pages of crimson fields and falling tears, one can find the Helen Maria Williams who would live through--and write about--the revolutions of her own time. Deborah Kennedy is Professor of English at Saint Mary's University, Canada. Leave a comment on Deborah Kennedy's review.